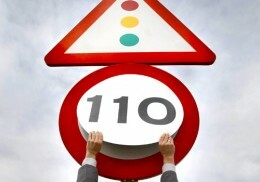 The new speed limit of 110 kmh on motorways and dual carriageways came into force early today. Plans to cut down on the national bill for crude oil, was formally passed by Parliament last week in response to soaring oil prices caused by the continued unrest in Libya, which supplies around 13 per cent of Spain’s oil. Traffic authorities say the switch-over, which meant that signs had to be changed on almost 10,000 km of road during the night, by teams of workers on the TF-1 and TF-5, has gone smoothly and motorists are observing the new limit, 110k per hour. Speed traps throughout the country have been adjusted to take into account the new figure, which will remain in force for four months and then be reviewed.